I, Jim Behnken, Western Regional Director, just finished up the very first ever C.A.S.T. for Kids event held in Lubbock, Texas. Located in the High Plains of West Texas, Lubbock is not a part of the country known for having lots of lakes for fishing opportunities. Every C.A.S.T. for Kids event is a special experience. However, this event seemed even that much more so. It was incredible how many children had never been fishing before. 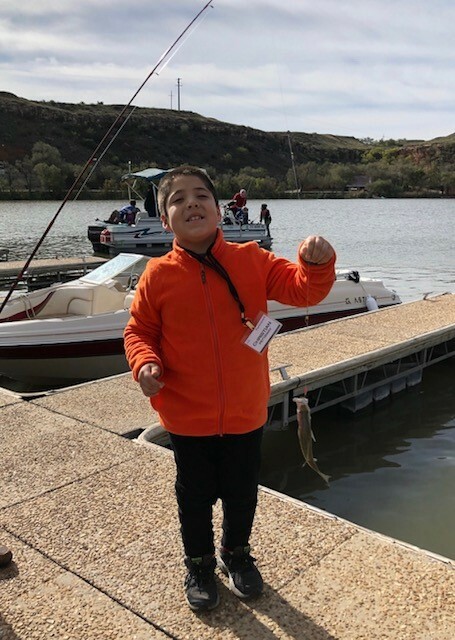 Words cannot properly express the emotions a child shows as they come off the water excited, telling you all about the first ever catch in their life! Troy White and his committee members had the event incredibly organized. 41 children were greeted by 24 boat captains who took them out on Buffalo Springs Lake. Troy gave credit to the new 2018 C.A.S.T. coordinator online training HUB as his saving grace for pulling off such an efficient, first-time event. The committee had all of their grounds covered. Boat launching, registration, name tags, pairings, lunch, and awards ceremony all which were flawless. The training HUB definitely served it’s purpose which is to provide coordinators an efficient manner in which to manage their individual events. The highlight of the day for me came early in the morning. A young man, suffering from autism came up to me and told me that he had been registered to attend for a long time. He told me that he had been waiting for this day for what seemed like forever. A cold front put a damper on some of the fishing action, however, this young man was able to catch three beautiful fish. I was so happy for him. “Best day ever,” he screamed at the award ceremony! He absolutely made my day. The final C.A.S.T. for Kids event in the western region for 2018 ended on an absolute high note for everyone involved. who truly do make the C.A.S.T. for Kids Foundation everything that it is. *Find out more about volunteering or to inquire about hosting an event in your local community!